Animal minds -- So animals feel pain? Are they "trapped in the present"? Do they have a sense of self? Are animals capable of any sort of morality? Etc. Animals and theology -- Is animal pain an insoluble difficulty for theists? Etc. 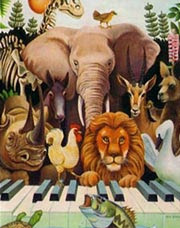 Animals and ethics -- Lots and lots and lots of topics. Animals and the environment --Does it matter if species go extinct? Do wild animals matter in a special way? Etc. Vegetarians, Vegans, Ethical Omnivores -- Lots of topics. Hunting -- Is it defensible? Is a hunter's use of deception unethical? Factory farming and humane farming-- Should humane reforms be supported? New frontiers -- Should we pursuit innovations like "lab meat"? Should we genetically engineer pain-free livestock? Ethics and activism -- Which strategies are ethically dubious? Feminist approaches -- Does feminism shed light on issues about our treatment of animals? I think it would be remiss to leave out the hubub over Francione and yourself. So I vote for that, I'd also vote for the zombie cow. I will probably include my "zombie" cow series. Hey, send me something yourself, and I'll include it. Something I wrote on my blog? Or something I wrote period? Could be an old blog post or a new blog post. Philosophers' Carnivals are compilations of blog posts.